Do you ever have those weeks...where they all blend together...because you have WAAAAYYYYY to much going on? Running for kids, planning for observations, grades, yada, yada, yada...Well, the last four weeks have been like that. A blur! So...I am late to the party! Farley, Over at Oh, Boy 4th Grade is hosting the monthly linky party, Currently! It is the 7th day of February...my oldest daughter's 20th birthday...and I am currently sitting in a hotel room again. Loving: What a great testament to parenting when your child thanks you for how you raised them! It makes me cry just thinking about how beautiful that note was today. All four of my kiddos...amazingly awesome...kind...hard working...what every parent wants! I feel so lucky! Needing: I have never grown microgreens before...but hey...being the School Garden Gal, we should try it! Over 1/2 of all of our 4th and 5th graders are willing to give up their recess to learn and grow winter greens. Wow! How awesome is that. Stay tuned the next two weeks for updates on our indoor gardening project! 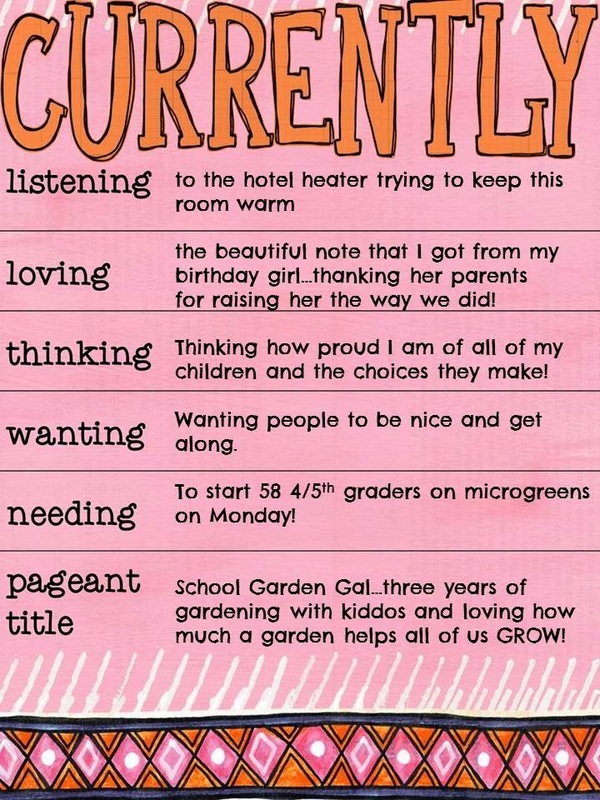 Gardening has helped me grow into a better teacher...watching how it has also changed our students' point of view of healthier food choices...and the life skills of gardening...are priceless. Here is the north...we get "cabin fever"...so we need to get our kiddos excited! Butter making...lunch taste testing...growing microgreens...has made this school garden gal busy...but not too busy to connect with my blogger buddies! I am a science gal, like you! I am so glad to find you on Currently! I can't wait to tour your blog!!! Have a very Happy week and stay warm! The idea of a school garden is awesome. I wish that our school had a bit more outside space because I would love to do that!